BlogHome » Why and How to Choose a Multi-purpose Floor. A multi-purpose floor in a Fellowship Hall is nothing new. These days, most Churches either have a multi-purpose floor, are planning to get one, or are dreaming of one. A multi-purpose floor serves as a place to recreate on all levels in a place of worship. Uses include congregation activities such as sports, banquets, social, child care, community, fund raising, and most importantly… FELLOWSHIP! These multi-purpose rooms are often the “go-to” location once the sermon is over, creating a diverse gathering of church goers in one area. With everyone gathered in one room naturally, it serves to increase the unity and fellowship of the members involved. Chose different lines for different games. That being said, there are more factors to consider when choosing the design of such a vital space of your Church. With all the design, fund raising, construction headaches and sweat equity involved in this huge undertaking, you need to be sure your making the right decision. Have meetings on your floor. One such decision is the type of flooring you select. There are so many multi-purpose floor options available today and with proper research and consideration, you can find the right surfacing material to suite your needs. Tables, chairs, food, drink, shoes, children, ease of maintenance, durability, sustainability, repair-ability, aesthetics, sound absorption, performance, safety… wow!!!!!! Are we still talking about floors? Who ever though there was so much to consider? Put your Church logo on the floor. To make a favorable decision as to which flooring material to choose, the whole congregation needs to be involved. 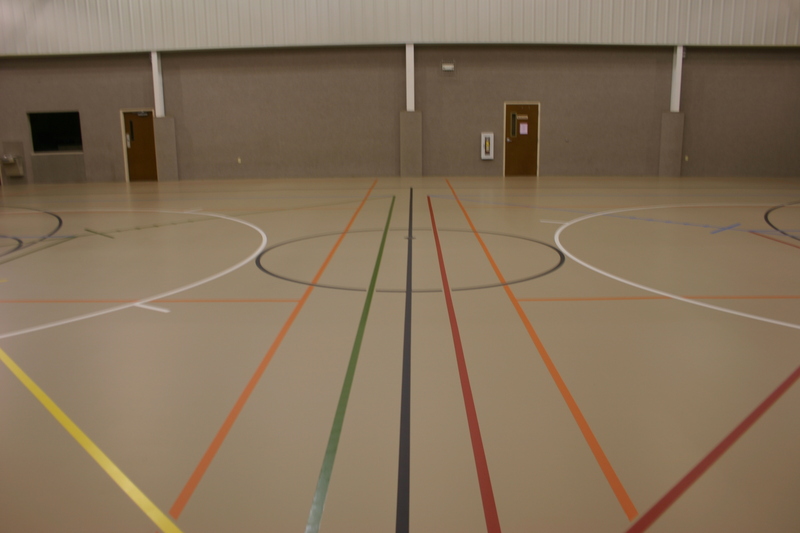 By presenting the church members with the facts, you can receive valuable input as to which flooring is right for your church. No important decision should be made without first presenting it too the congregation and then discussing the feedback received amid the appropriate committee members. There are many multi-purpose floor options available today; probably more than any of you realize. Budgets will play a major role in this decision, as will aesthetics. Equally you need to think about diversity……what multi-purpose floor will do the most for you? Turn your gym into a cafeteria. Seamless flooring has proven over time to be the most durable, diverse and sustainable type of flooring in this heavily used application. Wood flooring is expensive and can be expensive to maintain. Sheet flooring (vinyl and such) does not offer the resilience and is prone for failure at seams. Traditional tile floors offer little aesthetic value and no resilience or safety. Carpet is tough to keep clean and looking good, offers no resilience or sports performance and has learned bio security (bacteria) issues.Today there are options. Abacus Sports Installation has consulted to Churches nationally for over 20 years. Padenpor has been recognized as the preferred product. It is resilient, seamless in construction, durable, easy to clean and will sustain through all of the diverse application of fellowship use. Put a running track in with a stage. Padenpor starts with a recycled rubber basemat. This basemat is available in different thicknesses and densities depending on you particular focus. Once the basemat is installed, Abacus’ certified installers will apply up to 6 layers of self leveling durable polyurethane coating with meticulous attention. Finally, game lines are applied to add the finishing touch to your exciting, new clean, durable easy to clean sustainable fellowship space.